What do Rose Kennedy, Bob Hope, George Burns, Grandma Moses, Irving Berlin and Bob Ballard have in common? They're influential... funny... community involved... creative... even musical. And beyond all that, each lived to celebrate his or her 100th birthday. Bob Ballard stands unique among those six people because he not only made it to 100.... he's alive and kicking, and still charming everyone around him. Right about now, many of you are probably asking -- who exactly is Bob Ballard? Bob has spent his entire life (100 years, and counting) in the state of Georgia.... specifically Rome, Georgia for the majority of that time. He started his working career 80 years ago with Georgia Power Company. Even though he's officially retired, Georgia Power honored Bob last month with his 80-year service award.... recognizing him as having a longer association with the utility than any other person in its history. And "the Ballard legacy" hasn't stopped after Bob's retirement. Both his sons, Bobby and Jack, followed in their father's footsteps with careers at Georgia Power. Bob is also my uncle. For 55 years he was married to his beloved Lena, my mother's older sister. Now, you must understand, the tentacles of my extended family reach far and wide in all directions. That's something that can easily happen when your mother is one of 15 children. Anywhere I travel, there's sure to be a cousin somewhere nearby. This past Sunday I drove down to Rome with my wife and daughter to join the celebration of Bob's 100th. And -- no surprise -- there were cousins galore. People came from far and near, like ships drawn to a beacon in the night. 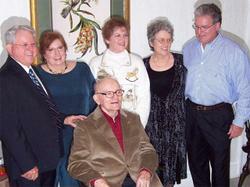 Standing around him in the attached photo are Bob's five surviving children, Bobby, Judy, Helen, Sissy and Jack. Sadly missing is his youngest daughter, Dixie, who died two years ago. Quite a few of Bob's 15 grandchildren and 21 great-grandchildren were also there. Bob moves a little slower these days, using a walker to help him along. But every step he takes is another notch forward in a life lived with remarkable humor, love, goodness and generosity. "A life lived with integrity - even if it lacks the trappings of fame and fortune - is a shining star in whose light others may follow in the years to come."